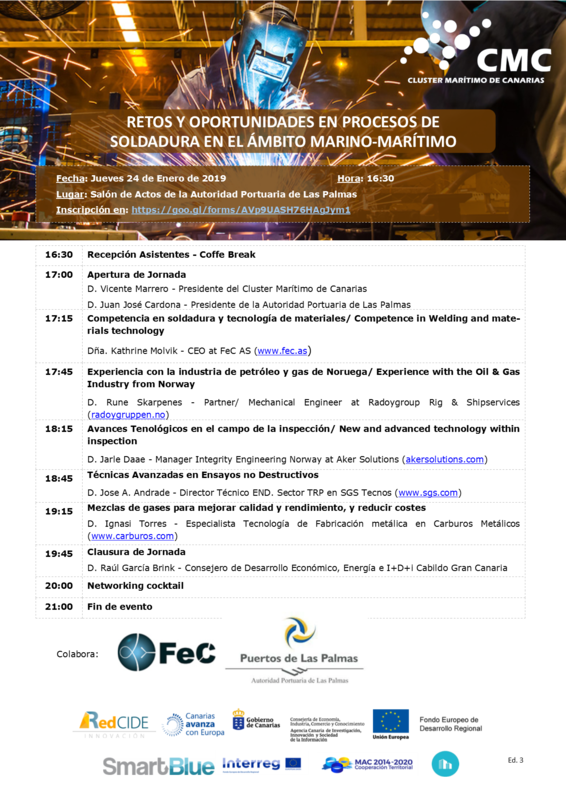 From the Maritime Cluster of the Canary Island we invite professionals and entities that have an interest in welding to “CHALLENGES AND OPPORTUNITIES IN WELDING PROCESSES IN THE MARINE AREA”, that will take place on Thursday the 24th of January 2019, at 16:30, in the events hall of the Port Authority of Las Palmas. The center specialized in training and research in welding processes FeC AS (www.fec.as) and the Port Authority of Las Palmas collaborate in the organization of this event. Among the speakers are relevant organizations on the subject to be discussed, at an international level, such as: FeC AS (www.fec.as), Aker Solutions (www.akersolutions.com), SGS Tecnos (www.sgs.com), Radoygroup Rig & Shipservices (https://radoygruppen.no/), Carburos Metálicos (www.carburos.com). To assist it is necessary to confirm: https://lnkd.in/eESFQCi (confirmation of place will be sent prior to the event).